Has paws with claws like a cat, a long tail like a monkey, and round ears like a weasel. Its coat is short, usually a rich brown color with a golden tinge. The fossa’s tail makes up about half of the animal’s length. Climbing high up into trees and jump from branch to branch, the fossa can climb down the tree headfirst using its claws. Fossas nap and hunt day or night depending on mood or circumstance. The fossa is a carnivore and preys on small to medium sized animals from fish to birds. 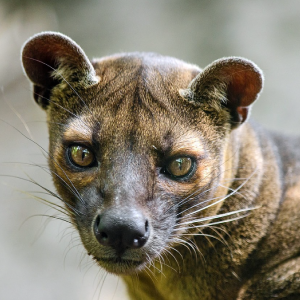 The fossa is one of the top predators on the island of Madagascar.